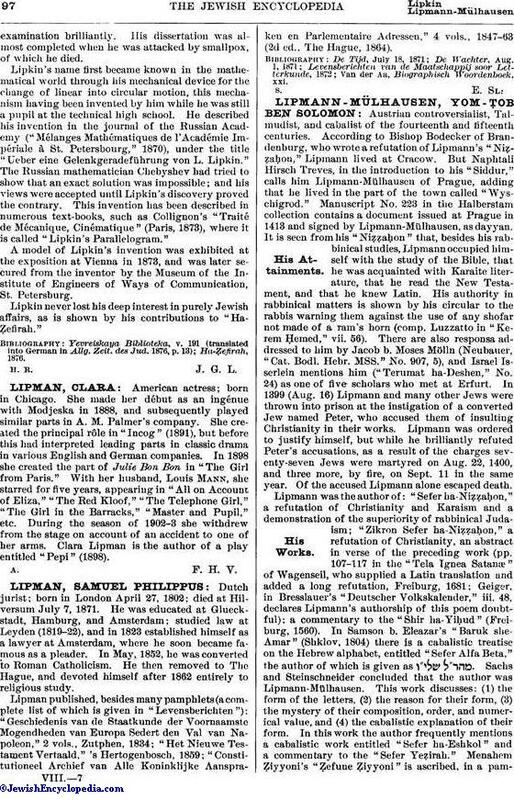 Lipmann was the author of: "Sefer ha-Niẓẓaḥon," a refutation of Christianity and Karaism and a demonstration of the superiority of rabbinical Judaism; "Zikron Sefer ha-Niẓẓaḥon" a refutation of Christianity, an abstract in verse of the preceding work (pp. 107-117 in the "Tela Ignea Satanæ" of Wagenseil, who supplied a Latin translation and added a long refutation, Freiburg, 1681; Geiger, in Bresslauer's "Deutscher Volkskalender," iii. 48, declares Lipmann's authorship of this poem doubtful); a commentary to the "Shir ha-Yiẓud" (Freiburg, 1560). In Samson b. Eleazar's "Baruk she-Amar" (Shklov, 1804) there is a cabalistic treatise on the Hebrew alphabet, entitled "Sefer Alfa Beta," the author of which is given as . Sachs and Steinschneider concluded that the author was Lipmann-Mülhausen. This work discusses: (1) the form of the letters, (2) the reason for their form, (3) the mystery of their composition, order, and numerical value, and (4) the cabalistic explanation of their form. In this work the author frequently mentions a cabalistic work entitled "Sefer ha-Eshkol" and a commentary to the "Sefer Yeẓirah." 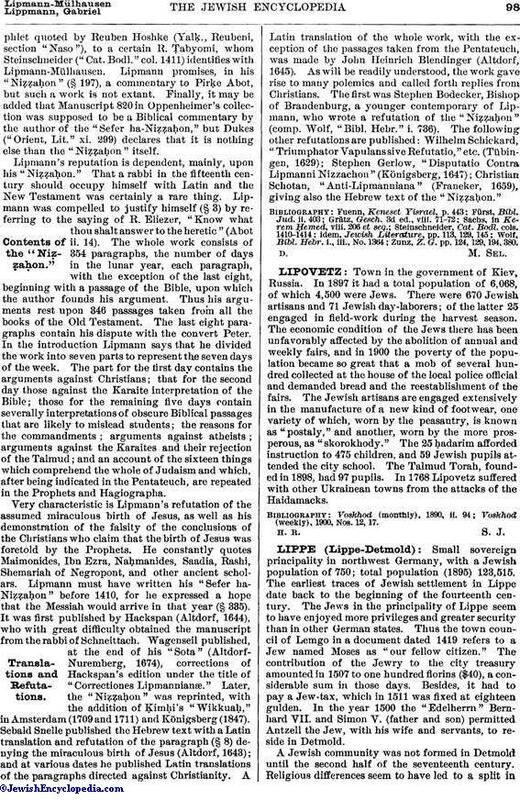 Menahem Ẓiyyoni's "Ẓefune Ẓiyyoni" is ascribed, in a pamphletquoted by Reuben Hoshke (Yalḳ., Reubeni, section "Naso"), to a certain R. Ṭabyomi, whom Steinschneider ("Cat. Bodl." col. 1411) identifies with Lipmann-Mülhausen. Lipmann promises, in his "Niẓẓaḥon" (§ 197), a commentary to Pirḳe Abot, but such a work is not extant. Finally, it may be added that Manuscript 820 in Oppenheimer's collection was supposed to be a Biblical commentary by the author of the "Sefer ha-Niẓẓaḥon," but Dukes ("Orient, Lit." xi. 299) declares that it is nothing else than the "Niẓẓaḥon" itself.